Head to any booking site, search for Maldives holidays, and you will notice that a huge number of the resorts offer all-inclusive packages. In fact, the Maldives has one of the highest concentration of all-inclusive resorts in the world. These all-inclusive packages provide you with a way to dine, drink and relax without fear of being presented with a huge bill at the end of your stay. Because of the remote location of these 110+ resorts, almost everything has to be imported, so all-inclusive stays provide a much more economical way to enjoy a tropical getaway. Are you considering booking an all-inclusive holiday to the Maldives? If so, a little research will go a long way and allow you to get the most out of your stay. We’ve done the legwork for you and created the ultimate guide to Maldives all-inclusive holidays, so you can choose whether it’s the best option for you. What’s Included in An All-Inclusive Holiday? The answer to this question will vary widely depending on what resort you choose to stay at. Most all-inclusive options will include all of your food, including breakfast, lunch, and dinner. Often, there will be a large buffet, where you can take your pick from a range of dishes. 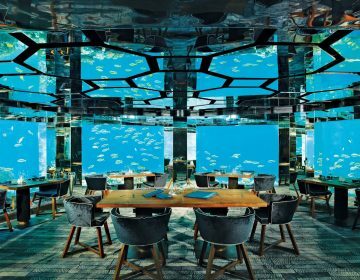 Many hotels like to put on themed buffet nights to mix things up for guests, so you could be feasting on European favorites one day, and sampling Maldivian cuisine the next. Often, snacks will be included in the price too. Some resorts have dedicated snack bars, often by the pool, where you can enjoy small bites if you feel peckish inbetween meals. Some resorts, such as Constance Moofushi, will also offer a fully-stocked mini bar that is filled with drinks, chocolate and other goodies that you can enjoy free of charge. Room service is not so common, although some will include it in the all-inclusive package while others will offer it as an add-on service. Drinks are also included in an all-inclusive package, be it soft drinks, juices, beer, wine and spirits. Check whether your resort offers local spirits or premium spirits in the price, as this can make a huge difference to the quality of your drinks. Some activities may be included in the package, such as yoga lessons, evening entertainment, and watersport hire. What’s Not Included in All-Inclusive Holidays? Your airfare will not be included in the price of your holiday unless you decided to book a Maldives package holiday which bundles together your flights and accommodation. Also, transfers are typically not included. You’ll need to hop on a seaplane in order to get to most of the resorts, and the cost of your seaplane ticket can often be more than your international flights, so be sure to check transfer costs before you book. For closer resorts, a boat journey may do the trick. Costlier activities such as scuba diving will not be included, as will things like jet-ski hire and excursions such as private boat hire or dolphin watching trips. Some resorts offer a romantic private beach dinner for two, which will come at an extra cost but will certainly be worth it for the experience. Despite being all-inclusive, many resorts have higher end a la carte restaurant where you can dine at no extra fee. You may be given a discount, or perhaps even a free meal per person during your stay, which you should take advantage of. A service charge is often included in an all-inclusive holiday, although we do recommend leaving extra tips if you are well looked after (more about that later. You will need to know what type of meal program is offered, what drinks are available in the package price and what activities are included too. Are there any extras required during your stay? Who is the resort open to? If you prefer to have a quiet and relaxing stay, then it’s a good idea to book yourself into one of the adults-only all-inclusive resorts. If you’re traveling with all the family, then make sure that children are accommodated. Reviews are very important when it comes to scouting out the very best Maldives holiday resort for your needs. Don’t just check reviews on the resort’s website, as often they will filter out the ones that aren’t so complimentary. Instead, head over to Tripadvisor and do a little detective work on the resort that you wish to stay at. This will allow you to get honest opinions from past guests. 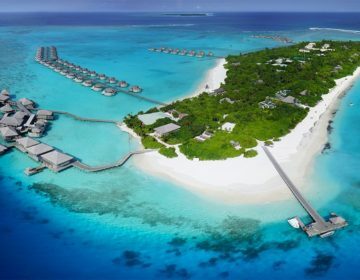 If you have friends or family members who have enjoyed a Maldives all-inclusive holiday, then it’s also worth asking them for their recommendations as to where to stay. 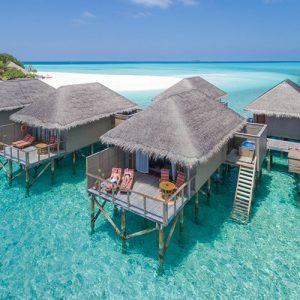 Maldives all-inclusive holidays can be pricey, but taking into consideration that amount of food, drinks, and activities that are often included, they can actually work out to be rather economical indeed. Keep in mind that most of the food and drink you enjoy there will be imported, which means that they cost an awful lot more than they would back home. There is also an 18% tax which is added to meals that aren’t inlcuded in an all-inclusive package. Simply put, all-inclusive holidays will allow you to relax and enjoy all that your resort has to offer. Afterall, the last thing that you want to be doing is worrying about how much you are spending. 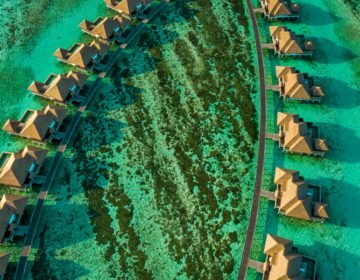 The Maldives are a once-in-a-lifetime destination, so if you really want to enjoy it all and not keep an eye on your budget, then all-inclusive is for you. What are the Cons of Staying at an All-Inclusive Resort? Well, if the dining options are not up to scratch then you may be trapped with what you can eat while you are away. This means that you may even have to fork out extra to eat at the signature restaurants. Food quality plays a huge role in how much you enjoy your Maldives holiday, so check out those reviews! Overall, the positives of an all-inclusive holiday far outweigh the cons. When Is the Best Time for an All-Inclusive Holiday to the Maldives? If you’re a sun worshipper then you will want to visit the Maldives between the months of December and April. This is when temperatures are higher and skies are bluer. But there is a downside, and that is the cost. 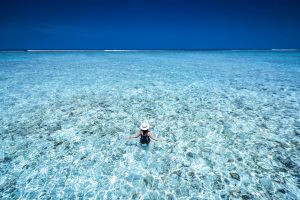 The price of your Maldives holiday will skyrocket if you choose to visit between these months, particularly if you are planning on visiting over a holiday such as Christmas or New Year. If, however, you want to get the best value all-inclusive holiday, then we recommended heading to these tropical islands between the months of May to November. This is when you can score discounted holidays that are up to 50% less than if you were to travel in high season. You will experience overcast days, and more likely than not rain, but sea and air temperatures remain beautifully warm, and crowds are thinner too. Check out this article for more information on the best time to visit the Maldives. How Long Should You Spend at an All-Inclusive Resort? How long is a piece of string, and how big is your budget? A great length of holiday for the Maldives is one week. Why? Well, because staying in these resorts can be a very remote experience, and there are no sites to see nearby. While it is incredibly beautiful, some people report that a week is an ideal time to relax and rejuvenate before they are ready to head back to the real world. If you want a 2-week holiday, then you can choose to stopover on the way to create a multi-break trip. Popular destinations to head to on the way include Dubai , Singapore , and Thailand. Saying that, if you really want to unplug and get away from a hectic life, then a two-week vacay could be perfect for you. Especially if you’re the type who doesn’t get island fever, and you could easily spend 14-days chilling out on those white sands. Resorts do offer a range of activities to keep guests entertained, and menu offerings will change frequently too so that you won’t get bored of the same dishes. Do I Need to Tip on an All-Inclusive Holidays to the Maldives? Tipping is not compulsory, and as mentioned above, most resorts automatically include a 10% service charge in your booking. Saying this though, resort workers will often earn very low incomes, and leaving a tip will be greatly appreciated. You can choose to leave a tip in an envelope and leave it on your bed for the cleaners who work hard to keep your room spotless. If you have a favorite bartender or server then tipping them something to say thank you will also be received well (and they will take extra care to look after you during your stay). It is recommended that you leave a tip after having any spa treatments or massages, often you will be able to leave a tip when you sign for your treatments and then pay at the end of your stay. Head here for our top picks on Maldives spa resorts. If you’re not sure if an all-inclusive option is for you, then you may want to look into some of the other packages that are available. A half-board package includes breakfast and dinner, and quite often a range of drinks and snacks too. There is also a breakfast-only option, or a room-only package where no extras are included in the price of your holiday. Savvy travelers are using these simple tips to really make the most of a Maldives all-inclusive holiday. If you have any sort of dietary requirements, such as if you’re following vegetarian, vegan or on a gluten-free diet, then it’s worth emailing or calling the hotel before-hand to let them know. All of the top resorts accommodate these types of dietary requirements, and the chef may even create you some special dishes. When it comes to your room, you can do a little research (again TripAdvisor is your best friend) as to the top rooms that are in the resort. Then you can email the resort and request that you reserve that specific room. Make sure that you give them several room options, so that if the first is already reserved you have back-up. As soon as you arrive, ask to see the entertainment schedule. The concierge will happily advise you on what’s going on during your trip. Quite often there will be a few events, classes or workshops that aren’t listed on the website. Finally, make friends with the staff. While it’s polite to be courteous to all staff, you can really go above and beyond to make friends with bartenders, servers, concierge, and instructors on the island. Quite often they will be able to tell you more about the local culture, and even have some stories to tell too! So what is calling you most? An all-you-can-eat all-inclusive extravaganza, a half-board getaway or even a room-only stay? No matter what type you choose, you really can’t go wrong with a holiday to one of the most breathtaking places on earth. Afterall, what’s not to love about towering palm trees, oceanside hammocks, and glittering turquoise waters? Happy travels! Maldives is a great place to spend quality time on vacations for family as well for couples if you are spa lover you can enjoy body massage and can feel body fully relax here at low rates. If you are budget oriented then you can plan your holidays in May to November month as you can discounts up to 50%.